What to do when your beloved Rover or Felix passes away after years of devoted companionship? Instead of sadly marking their demise with no more ceremony than digging a hole in the garden and putting away the feeding bowls, an Okinawan company has come up with an alternative. The Okinawa Pet Funeral Service Center provides the appropriate ceremonial send-off now required by increasing numbers of animal lovers. When the furry loved one shuffles off its mortal coil, the pet funeral company dispatches its truck to the home of the recently deceased. The back doors of the vehicle open to reveal flowers, incense and a dignified wooden coffin. Before the four footed companion begins its journey to a better place there is time for reflection and prayer. Flowers and incense are provided and a tape with appropriate mood music: heavenly children’s choirs and Buddhist type chants with monks’ ceremonial drum sounds are available. Once the obsequies are complete the dead pet is placed inside a disposable coffin made of cardboard and it makes its final exit in an area where some curtains screen off most of the interior of the truck. Here is a petroleum fired incinerator with a wide chimney pipe just behind the cab. As in Buddhist tradition, flowers are delivered to the bereaved seven days after the death. Grieving pet owners also have a choice of various types of memorials for the tails that wag no more. They can have memorial stones inscribed with names and pictures of their animals. These come in various sizes. Some are designed to hold their pets’ ash. Owners can also have the ash returned to them separately. If they don’t want this reminder of the once pampered hearth resident, the ash will instead be taken to the public pets’ cemetery in Shuri. As there was no provision in Okinawa for four footed send-offs to the happy hunting grounds, Yoshida and his business partner Tetsuo Otani thought they it was about time they established one. They would do the funerals and the stone sculpting work would be contracted out to China. All the pet owners would need to do was provide a photograph and the wording the wanted, which would be forwarded to the Chinese stone masons. They displayed two examples of the Chinese sculpted headstones, a simple block of black marble with a picture inscribed on it of a cat named Merry, climbing a tree. 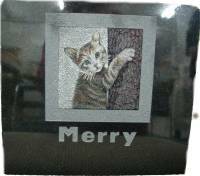 The picture done with a needle and including colors was finely executed. 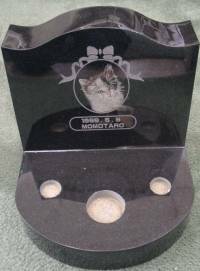 A more elaborate stone, in memory of a cat called Momotaro had space for ash and candles, showed the date of death and a picture, a head study, again well done, below an inscribed ribbon. Cremating dogs is 60% of the work of the Okinawa Pet Funeral Service Center and the rest of the demand is for cats. Although it is early days for the service, its two founders are not expecting any great demand among Okinawans for funeral rites for goats, pigs or cows. The company’s smallest memorial stone costs ¥10,000, a larger one ¥20,000 and a still more elaborate stone is ¥40,000. The funeral itself costs between ¥10,000 and ¥40,000, depending on the deceased animal’s weight. For more information phone 0120-594-288.